In July of 1905, THE EDISON PHONOGRAPH MONTHLY published this comment by the National Phonograph Company Export Division's new manager: "Until a year ago … we paid little attention to export possibilities. We are going ahead on the plan of giving our foreign customers just what they want … We have sold thousands of machines in Mexico … and have an agent now who is making a tour of South America. The Spanish speaking people in those countries are great lovers of music … "
Always a visionary, Lieutenant Gianni Bettini had been actively selling his phonographic wares in Latin America years earlier … shortly after he transformed what had been an expensive hobby into a commercial enterprise. However, a Bettini link to Hispanic America even predated this change, although he may not have been aware of it. 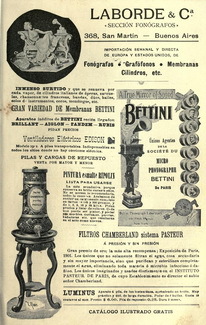 As early as 1895, a Bettini talking machine was exhibited at the Grand International Gallery, No. 12 Santa Clara Alley, in Mexico City. 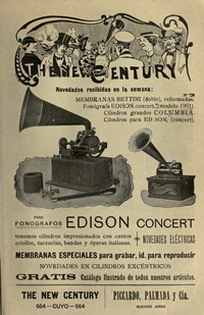 A review in LA VOZ DE MEXICO of June 19, 1895, described its demonstration and mentioned that no listening tubes were needed to hear the program of predominantly French music. Paid announcements about this appeared in another periodical … EL MONITOR REPUBLICANO, on June 28th, July 4th, and July 20th. 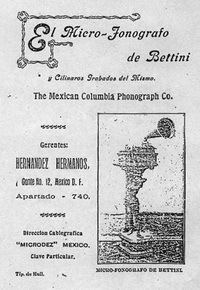 Beginning on March 31, 1898, the phonograph firm of Hernandez Brothers, 12 Gante Street, Mexico City, placed advertisements in the English-language MEXICAN HERALD which declared: "THE BETTINI MICROPHONE attachment, [the] wonderful invention of a wonderful age, when attached to an ordinary Phonograph, improves it to such an extent that the sound is unlike that of instruments thus far considered the best ... " The same broadside continued to be placed in that newspaper through August 18, 1898. The contacts between Bettini and Hernandez Brothers must have been extensive, as a ca. 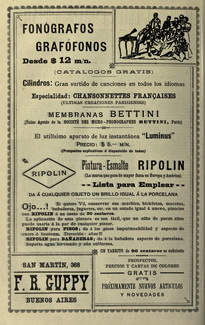 1899 catalogue it produced under the title "El Micro-Fonografo Bettini" made considerable use of the Lieutenant’s graphics. Even the telegraph address listed on its cover, "MICRODEZ," was influenced by him. Mexico City was the site of the first discovery of a Bettini cylinder cache, when collector Ray Phillips found a group of them in an antiques shop, in 1945. A comparison with the Bettinis listed in the Hernandez Brothers catalogue showed several exact matches. Writing in THE HILLANDALE NEWS of October, 1972, Ray mentioned that: "Many of the boxes carried small one-inch gummed labels reading J. Morales y Cia [which] not only imported phonographic material from the United States and Spain, but recorded in Mexico City under its own label." Ray bought quite a few cylinders from the store, and I do not believe any of these J. Morales recordings were Bettini’s. 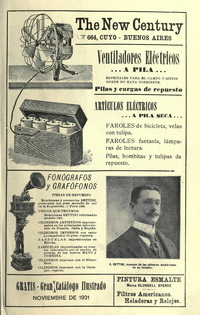 However, that firm was, by 1901, selling the Lieutenant's product line, and mentioned his name in advertisements it placed in EL TIEMPO from May through September, in EL POPULAR on September 14th, and in EL PAIS on September 14, 1901. By 1900, Lieutenant Bettini had a minimum of three jobbers in Buenos Aires: F.R. Guppy and Company of 368 San Martin, Piccardo, Palmadie and Company (aka The New Century) of 664 Cuyo, and Laborde and Company at 368 San Martin. All of them made considerable use of Bettini’s distinctive illustrations in their announcements. Judging by the frequency in which these ads appeared, they must have done a brisk trade. Lieutenant Bettini undoubtedly had especially close ties with F.R. 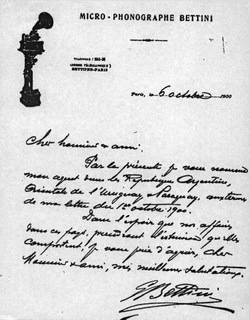 Guppy, because on October 6, 1900, he wrote a note, in Spanish, authorizing it to be his exclusive representatives for Uruguay and Paraguay. So proud was F.R. Guppy about this assignment that it reproduced the letter, at least once … in the March 2, 1901 edition of CARAS Y CARETAS. F.R. Guppy may well have advertised in Uruguay and Paraguay. Although an autonomous member of the Kingdom of the Netherlands, a good case can be made that Curacao is partially Latin American. Originally falling to the Spanish conquest, it was not governed by the Dutch until 1734, Curacao’s population primarily speaks Papamiento, a Creole language that incorporates Spanish and Portuguese, and Spanish itself, is widely spoken on the island. Even the name Curacao is believed by many to be derived from corazon, the Spanish word for heart. Just thirty-seven miles from the coast of Venezuela, Curacao’s cuisine, music, dances, and culture, in general, have strong Hispanic characteristics. Indeed, Curacao’s leaders and press have referred to it as: "The hub to Latin America." Consequently, it is relevant to include a Curacao-Bettini venture among his Latin American connections. The owner's name was Dr. W.C. Gaerste, who at various times in the newspaper, AMIGOE DE CURACAO, starting on August 8, 1897, vaunted himself as an agent for "the Bettini Micro-Attachment." I do not know what kind of doctor W.C. Gaerste was, but several things are obvious to me. Firstly, considering Curacao’s small population, it remains doubtful that Dr. Gaerste made much of a living selling phonographic items there. However, Curacao has always had strong economic ties with Venezuela and Colombia, so it is quite possible that this Bettini dealer may have been active in those countries. And secondly, judging by the unattractive ads Dr. Gaerste issued, it is doubtful that Bettini had any role in their creation. I have not determined if Lieutenant Bettini ever visited Latin America, but that does seem likely. A filler in the May, 1899 PHONOSCOPE remarked: "Lieut. Bettini, unlike the majority of people who make a pilgrimage to foreign lands in search of pleasure, makes two or three trips each year, combining business and pleasure." 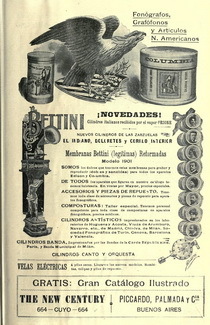 And the July, 1904 issue of THE TALKING MACHINE NEWS summed it all up when it declared that: "Bettini is known all over the world."